Joshua Reynolds is, historically, the most important figure in British painting. He was born on July 7, 1723, at Plymton St Mau­rice in Devon, where his father was head­master of the Grammar School and a former Fellow of Balliol*. * Fellow of Balliol — member of the board of governors of Balliol College of Oxford University. Reynolds was born and brought up in an educated family at a time when most English painters were hardly more than ill-educated tradesmen, Reynolds him­self became the close friend of Dr Johnson, Goldsmith, Burke*, and Garric, and it is prob­ably true he did more to raise the status of the artist in England through his learning and personal example than by his actual qual­ity as an artist. Burke, Ed­mund (1729-1797) — English statesman and political writer. He was an apprentice of Hudson* in 1740 in London, but in 1743 he left his master and returned to Devon; from 1743-1749 he was in practice on his own in London and Devon; before leaving for Italy in 1749. * Hudson, Thomas (1701-1779) — English fashionable por­trait painter in 1735-1755. In 1746, he painted the “Eliot Fam­ily Group”, based on a famous piece of Van Dyck, and this already shows the fundamen­tal basis of his art — the deliberate use of allusion to the Old Masters or Antique sculp­ture as a classical allusion might have been used by a 18th century speaker or writer. In 1749, he had the chance to go to Italy with Commodore*, (later Admiral Viscount) Keppel**, who was also to become one of his best friends. ** Keppel, Augustus (1725-1786), - British naval officer. Up to this time the main influ­ences on his style had been Hogarth, Ramsay*, and to a moderate extent only, Hud­son. He spent 1750-1752 in Rome, where he made a really prolonged study of the An­tique, of Raphael and above all, of Michel­angelo**. * Ramsay, Allan(1713-1784) — portrait painter, court painter to George III (1767). Michelangelo di Lodovico Buonar­roti Simoni (1475-1564) — Italian sculptor, painter, archi­tect and poet. He learned the intellectual basis of Italian art, and this way something that scarcely any other British painter, with the possible exception of Ramsay, had done up to then, even in Rome itself. In fact, Rey­nolds’s own practice as a portrait painter was more profoundly influenced by the few weeks he spent in Venice in 1752. He never ceased to exhort his students to master the princi­ples of Grand Style, and in fact he regarded Venetian art, and portrait painting, as of less importance. In 1753, he set up in London met Dr Johnson, and began rapidly to make a name. In 1768, when the Royal Academy was founded it was obvious that Reynolds was the only possible choice for the President. He was knighted in 1769 and made Doctor of Civil Law at Oxford and Mayor of his native Plympton in 1772. The works of the years following 1768 showed him at the most classical and most learned, determined to use the Academy as an instrument to forge a British School of History painting to stand beside those of Rome and Bologna. To this end he composed and delivered 15 Discourses on Art at the Royal Academy which are a very sensible exposition of the Academic position that it is possible to learn the Rules of Art and to use the inventions and ideas of one’s pred­ecessors to create a new style of one’s own. Reynolds did not want British art to be pro­vincial and isolated. It was he who insisted that artists should be brought up in the line with European art and that they should de­velop the Grand Style of painting. His lec­tures were regarded as the most sensible ex­position of the Academic view that by well-directed work it was possible to learn the rules of art and use discoveries and ideas of the old masters to create a new style of one’s own. He recommended that a would-be painter should put his faith in old masters from which he should be ready to borrow. He advised that in portraits the grace should consist more in taking the general air than in exact render­ing of every feature. He suggested that the proportions of a sitter’s figure should be al­tered in accordance with a fixed ideal. During the years Reynolds exhibited regu­larly at the Academy exhibitions and usual­ly showed a skillful blend of large portraits treated in a historical manner, history pic­tures proper, and some curious combinations of the two, such as “Dr Beattie (The Tri­umph of Truth)”, “Three Ladies Adorning the Term of Hymen”. This idea had been exploited by him as early as 1760-1761 in his “Garrick between Tragedy and Comedy”, which he exhibited in 1762 at the Society of Artists, the society’s precursor. In 1781, he made a journey to Flanders and Holland and was profoundly influenced by the force and freedom of Rubens’s* han­dling, and from then until his sight failed in 1789 his works are less consciously clas­sical and painted with greater warmth and feeling. * Rubens, Peter Paul (1577-1640) — a Flemish painter re­garded as one of the greatest artists, responsible for over 2000 paintings. The majority of his heritage consists of por­traits, which include almost every man and woman of note in the second half of the 18th century. 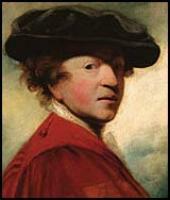 Reynolds died in London on February 23, 1792. Reynolds came to be the first English painter to achieve social recognition for his artistic achievements. His portraits were distin­guished by calm dignity, classical allusions, rich colour, and realistic portrayal of char­acter. His portraits form an epitome of Lon­don society of his day. Приезжай в дивноморск цены на пляж.